Symbid – the financial technology brand behind The Funding Network™, where companies get funded and grow – today announced the launch of its own loan crowdfunding product. The launch means Symbid now offers both equity and loan crowdfunding in addition to traditional and other alternative funding options via The Funding Network™ including angel investing, venture capital and bank loans. Loan crowdfunding by Symbid will make use Symbid’s internally developed monitoring tool and independent treasury management agency Catena – spin-off of leading risk management firm Zanders. It is a professional and more transparent alternative to current online lending options for both investors and entrepreneurs. Symbid is launching a new, more entrepreneurial way of crowdfunding loans which, based on advanced investing, monitoring and data tools, enables full transparency between investor and entrepreneur. Investors receive their return on a quarterly basis while monitoring the performance of their investment – including its risks and rewards – through a user-friendly KPI dashboard. Both equity and loan investments can be made from one account, meaning Symbid now has online investing covered. The pricing of each loan – the interest rate paid by the entrepreneur to their investors – is objectively determined by Catena Investments. By offering both equity and loan crowdfunding Symbid expects serve an even broader group of entrepreneurs with funding. FIZ lawyers, specializing in alternative finance, is providing legal support for the Loan Crowdfunding by Symbid product . “Symbid’s take on loan crowdfunding is innovative because it gives investors a deep insight into the performance of the businesses to which they have lent money. We see this degree of transparency as a huge step forward in the world of alternative financing,” said Jurian Snijders of FIZ lawyers. The launch improves Symbid’s offering to entrepreneurs by introducing a trusted market alternative to current online lending services. 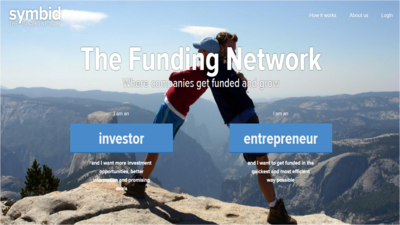 Entrepreneurs connecting to The Funding Network™ are brought to the right type of funding as efficiently as possible. This can mean crowdfunding (loan or equity), traditional funding options, or a combination of both. With the launch of loan crowdfunding Symbid is aiming to become the go-to funding platform for both investors and entrepreneurs. 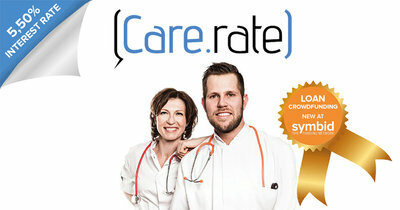 The first business to be funded via Loan Crowdfunding by Symbid is CareRate, a healthcare review app. The investment opportunity is now live on the Symbid platform.